Do you want to make your fave fresh and cooked foods, drinks, fruits, salads, pizza, etc. into an energy food? Now you can -- with CaffeinAll, the caffeine you control. Do you want to turn all your favorite foods and drinks into instant energizers? Just sprinkle CaffeinAll™ on your favorite fresh and cooked foods, drinks, fruits, salads, even pizza or ice cream to make them into an instant energy food. And it’s much less expensive than a cup of coffee, latte, espresso, or any of the energy drinks out there. CaffeinAll costs only 9 cents per 100 mg caffeine - the same amount that is in 8 ounces of strong coffee. Add it to any of your favorite food or drink and the effect is energizing: a delightful experience and an alert you! - And inexpensive to boot! CaffeinAll™ produces immediate energy because it takes full effect in only a few minutes, if you shake it directly into your mouth! And you can do this because it has no flavor and is only slightly bitter on your tongue. It is especially useful if you are going to a meeting, studying for an exam, or playing sports. Instant energy is extremely valuable in preventing drowsy driving, a condition that contributes to over 70,000 injuries and 5,000 deaths a year. One or 2 shakes and you are wide-awake in a few minutes. Caffeine does have a bitter bite, whether extracted from coffee or produced by synthesis. 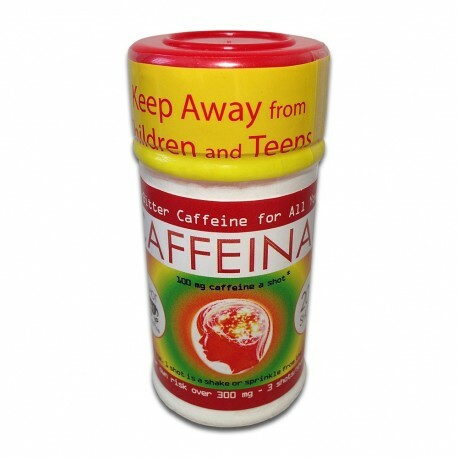 CaffeinAll™, on the other hand, is not bitter in your favorite food or drink; and only slightly so if sprinkled directly on your tongue. Why? Because it is completely encapsulated. As a free-flowing powder, it is very easy to control. Because it is not bitter and doesn’t add any flavor or aroma of its own, CaffeinAll is the perfect way to fortify your meals with caffeine at any time. You control the volume that you sprinkle on top of your favorite fresh and cooked foods, drinks, fruits, salads, pizza, etc… practically any food or drink you can think of. For example, 1 sprinkle shot from the handy shaker will put 100 mg on your food, the same amount you’d get from a cup of coffee. Best of all, you know how much you add with each sprinkle - an average of 100 mg of caffeine! It may be a bit more when the bottle is full and a bit less as it empties; however, they average out over the 200 shots from just one shaker. 9 cents for 100 mg caffeine from one sprinkle shot, like a cup of coffee? 18 cents for 200 mg caffeine from 2 shots, for that double coffee? 200 shots PLUS the convenience!!! LOVE, LOVE, LOVE my CaffeinAll! I add it to my breakfast smoothie to get my morning caffeine. It comes in a cute, retro 50's diner shaker with a chrome lid. Inside there is a shaker top with a clear sticker covering the holes in the lid--it is split in 2 parts. I recommend removing only one side--I took off both and sometimes I shake out too much. NO BITTERNESS! as long as you don't overdo it.... Also, the caffeine is in VERY fine powdered form so no grittiness at all. With 300 servings to the container, this one shaker will last me for months!